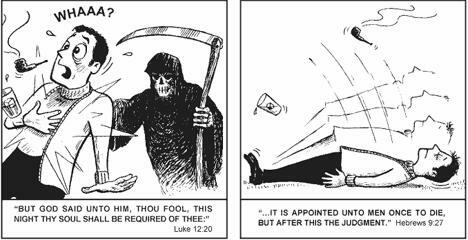 I have always loved Chick tracts. I can remember reading them as a child. I am not sure where I first received one, but they would pop up in the strangest of places: on public restroom urinals, truck stop pay phones, gas station counters, or handed out at rock concerts. Over the years, even in my adult life, I have stumbled upon Chick tracts (I remember seeing them being sold in some record and comic stores in the 90's) and thumbed nostalgically through them, delighting in their absurdity. I still have one in my bedside table drawer, and I thumb through it on occasion. 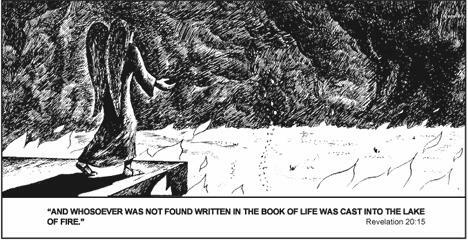 Beneath all the nostalgia and kitsch, however, when I look through a Chick tract, I can still feel the mild existential discomfort they inflicted on me as a child. These comics seem to reside in a certain corner of my mind, right next to memories of Ouija boards, backmasking, Anton LaVey, and the Satanic ritual abuse hysteria of the late 70s and early 80s. 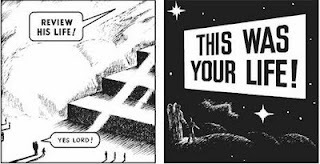 I recently ran across an animated flash version of the most popular Chick tract of all time, 'This Was Your Life.' It's pretty great, and I can't believe I haven't seen it before. The blog Jack Chick's Funnybook Gospel has a great post (a review, actually) about 'This Was Your Life.' As it turns out, this tract (hands-down the most popular Chick tract ever) is available in over 100 languages. The blog post features snippets of several different versions, adapted for black audiences, Chinese audiences, Indian audiences, and one for women. 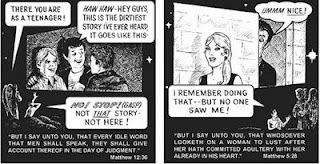 Anyone who has read more than a few Chick tracts will remember that the Gospel According to Chick is a very specific brand of Evangelical Christianity. Although Jack Chick's brand of religion echoes that of many TV evangelists of his time, he did not seek personal attention. Yet while he was a recluse (he has only given one interview since 1975), his work is known the world over. Chick Publications claims to have sold over 450 million tracts. Even if we account for some exaggeration, that's a lot of terrified children. Given the fanatical, dogmatic, and judgmental nature of the tracts, it may not surprise many that the Southern Poverty Law Center has labeled Chick Publications as a hate group. The tracts are anti-gay, anti-evolution, anti-any-religion-that-is-not-Chick's-brand-of-hellfire-Christianity. 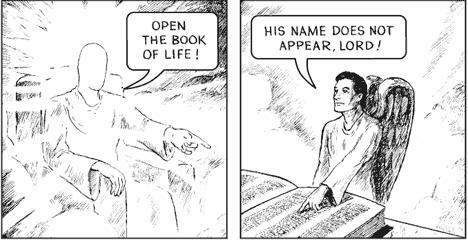 The tracts feature all sorts of bogeymen, including Islam, drugs, Halloween, gangs, alcohol, money, the gays, evolution, and 'false religions.' All of these things (and much, much more) are here to distract us from serving God. According to Chick, anyway. But no bogeyman captured our imaginations quite as much as death himself -- the reaper. Or no, actually that projector in heaven that replays all your worst moments as a human being. That's pretty horrifying. Also the Book of Life that does not contain your name is fairly disturbing. As is the eternal lake of fire. 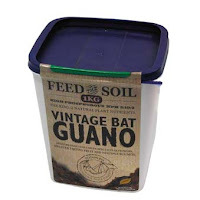 Harrowing stuff. In hindsight, Chick tracts represent what is wrong with religion, specifically the brand of fire and brimstone of evangelical Christianity. Here is what is implied by 'This Was Your Life,' (and what is often implied in many churches in America): You had better not make poor decisions, because every move you make is being watched, and every thought you think is being recorded. And these poor decisions will land you in a pit of fire for all of eternity, because let's face it, there's at least a good 20 minutes worth of questionable footage that we could play for the Big Guy. This begs the question -- do we really want to be surrounded by people whose behavior is shaped by fear and guilt? If you ask me, those are horrible motivators. I don't want children (or grown-ups) to act morally because they fear they will land in a lake of fire. I want them to act morally because it is good for humanity, society, and the environment. Our moral actions will benefit our fellow humans, and will benefit us as well. I want children to avoid making poor choices because they are worried about how it will affect them and others in this life -- not because they are worried about how it will affect the afterlife, of which we have no evidence. 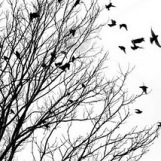 To avoid causing pain and suffering because one fears their own suffering in the afterlife is actually a selfish notion, and one based on a supernatural assumption. 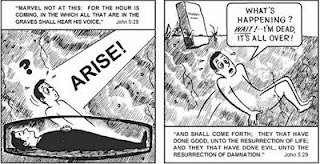 What's beautiful about the Chick tracts (aside from the fact that they're funny) is that they serve as a time capsule. They are fossils of beliefs that are endangered and which are being supplanted by more liberal theology, and ultimately, by secular morality. Imagine a world where humans do good deeds simply because it feels good, and because good deeds minimize suffering in the world. Imagine a world where guilt relates to how we have affected others, instead of whether or not we have disappointed an angry supernatural agent. The grim reaper, Satan, angels, a shiny faceless God in a big chair with a naughty-and-nice list, a burning lake of fire. At least Chick had foresight. This is the stuff of comic books. The latest from the creator of the Symphony of Science videos. "The Symphony of Time" is "a musical celebration of the concept of time," and features Dean Radin, Robert Lanza, Maurizio Benazzo, Alan Watts, Michio Kaku, and Brian Cox.